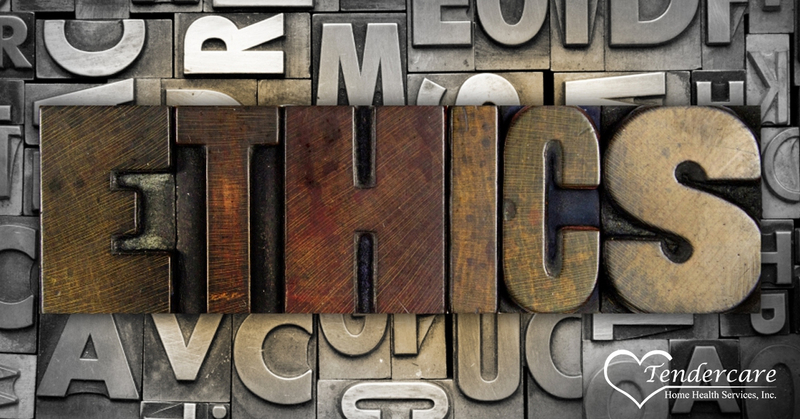 Why Is a Code of Ethics So Important With A Home Healthcare Agency? No matter what business you’re in, there is a code of conduct that needs to be followed. Some are more strict than others, such as the legal profession where a single transgression can get you disbarred. Others industries have codes of conduct that are posted on the wall of the break for employees to see on a daily basis, while still other businesses might follow conduct that’s unwritten and is slowly learned over time. Honesty – Each employee is expected to be honest in all situations. This includes interactions with fellow employees as well as those with the clients and their families. Integrity – Beyond honesty is integrity. Employees must do the right thing every time, even if it’s the difficult thing to do. Trust – We understand that our clients are entrusting us with their own well-being or the well-being of a loved one. This level of trust can’t be taken for granted, because it is nearly impossible to regain if broken. We are honored to be able to take care of those in need. Flexibility – We understand how schedules can change, especially when someone has the needs of a home care patient. We will do what we can to be as flexible as possible in order to accommodate schedule changes. Reliability – To the best of our human ability we will be there when we are scheduled to be. Your time is precious, and we will honor that. We’ll also be reliable when it comes to other promises we have made. Respect for Human Dignity – Each one of us became a nurse for a reason: we want to help people. Because of that, we will respect each and every person we come in contact with. Each employee is expected to keep these six important aspects of the code of ethics. They are also charged with holding their fellow nurses, managers, and administrators to this code. We take our code of ethics seriously, and that’s why we review them with every employee. Of course, our employees aren’t the only ones that are affected by our code of ethics, which is why we ensure everyone knows who the policy is for. For Our Nurses and Staff – Every nurse deserves to be treated with the same six attributes mentioned above, whether they are interacting with doctors, managers, clients, schedulers, or other nurses. If a nurse finds that others aren’t adhering to our code of ethics, he or she should be able to report the problem without fear of reprisal. For Our Patients and Their Families – Patients and their families should know exactly how they will be treated. We support many of our patients every day, sometimes providing 24-hour care. Because we’re around so often, we always want those in our care to know that we’ll be there for them and will always treat them with the proper amount of honesty, integrity, flexibility, integrity, reliability, and trust. For Our Community – We have deep roots in the Indianapolis community and believe that our staff should be approachable and dependable when dealing with each person in the area. For Those We Work With – As a business, it’s not only the patients and other nurses we deal with. We also have vendors and partners that we have to work with in order to provide the care we do each and every day. This means having the integrity to pay our bills on time and work with those who owe us, including insurance companies and government agencies. We are dedicated to providing the absolute best care in Indianapolis and beyond, and to do so it’s important to be as transparent as possible. This includes the code of conduct we’ve detailed here, which can be found in its entirety on this page. To put it simply, we will treat our patients, their families, our community, and other businesses and entities we work with with the utmost respect and hope that they will reciprocate. If you or a loved one are in need of a home health agency, contact us via this page, or find out more about the many services we offer such as pediatric home care, in-home occupational, therapy, physical therapy, elder care services, and more by clicking here.